The new Notification Extension is not available yet. WhatsApp is working on this feature from the 2.18.80 version, adding new improvements in the next updates. It’s not available yet for development reasons and the feature needs to get many other improvements before to be enabled for everyone. For this reason, it’s ok if you have updated your WhatsApp version and it’s not working for you seen that the feature is under development. Be patient to see the feature enabled in the next updates. WhatsApp has developed a new powerful extension that significantly improves notifications. You will be able to see some received media in your notifications thanks to the new 2.18.80 update! The new Notification Extension supports images and GIFs, but you will be also able to download them directly from the notification if you’ve disabled the Autodownload Settings! To view the media preview, it will be necessary to Peek and Pop or swipe down the notification. Our tests revealed the feature will work for iOS 10 and newer. Any comment about this? 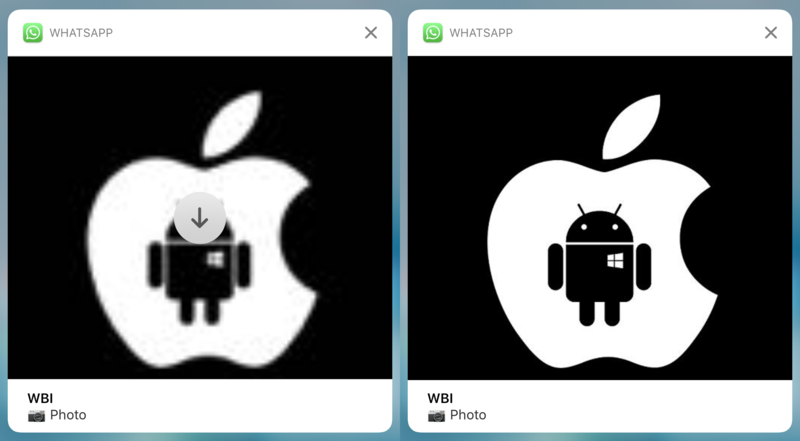 We personally love the new way WhatsApp manages notifications, also if we would see the thumbnail preview directly in the message notification! You can send now messages to your WhatsApp groups using Siri! The update contains bug fixes and general stabilization. Previous PostPrevious WhatsApp is globally rolling out the Suspicious Link Detection feature for Android!